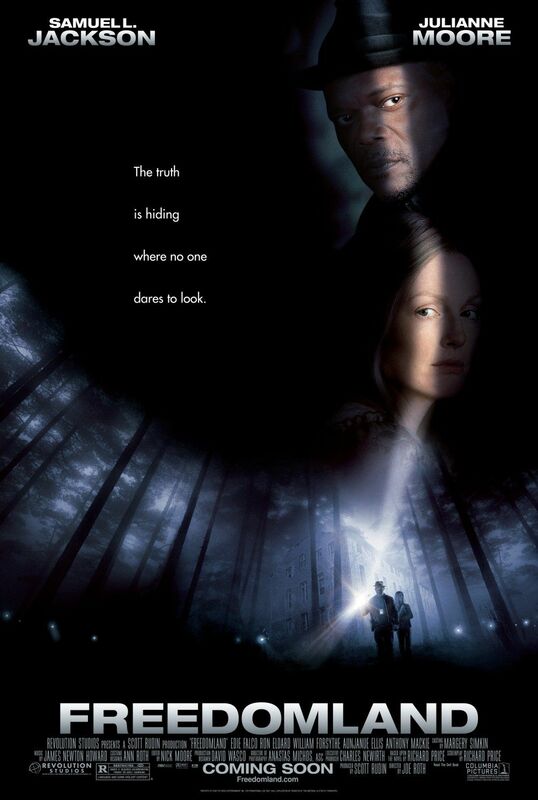 Alas, while Clockers got carried away with Lee’s stylistic flourishes (in my opinion, anyway), Freedomland, with the exception of a couple successful scenes, never really gets off the ground. The story hews very close to that of the original novel: Det. Lorenzo Council (Samuel L. Jackson), a cop accustomed to working the notorious Armstrong housing projects of fictional Dempsy, New Jersey, gets called in one night to interview Brenda Martin (Julianne Moore), a white woman from the nearby suburb of Gannon. Brenda claims that a black man carjacked her as she was passing through Armstrong, taking not just her ride but her four-year-old son Cody, who was in the back seat. As the Gannon police blockade and harass the increasingly outraged Armstrong residents, Lorenzo rushes to solve the racially charged case before his community goes up in flames. Jesse Haus, the reporter character who served as a co-protagonist alongside Lorenzo in the book, has been left out entirely here. While she never felt like dead weight, she’s not sorely missed, since she functioned more as a perspective on the other characters than as an active participant in the plot. Her removal is by far the biggest change from page to screen, which is actually kind of impressive given how dark the book was. The only Price novel that’s comparably bleak is Bloodbrothers, the movie version of which added an upbeat Hollywood-style ending. But that doesn’t happen here: Apart from the omission of one particularly crushing post-climax plot point, the original novel’s emotional brutality is left admirably intact. So the problem lies not with the film’s intent but with its execution, particularly the acting. I imagine that Brenda Martin, who’s understandably hysterical throughout more or less the entirety of the story, is a challenging role, but Julianne Moore (who was supposedly really excited about the part) never sells her hysteria as sympathetic and attempts a working-class Northeast accent so unconvincing that I had to double-check to make sure Moore isn’t actually British. (Two years later Amy Ryan would receive an Oscar nomination for her more successful portrayal of a similar type in Gone Baby Gone.) And while Samuel L. Jackson seems like a slam dunk for the role of Lorenzo, especially since he already played a variation on the character in the Shaft reboot, he never seems to hit the right level of vulnerability here. The climactic interrogation scene that finally reveals the whole truth could leave Lorenzo feeling any number of ways–enraged, disgusted, despondent–but Jackson just comes off as bored. Of course, the Karen/Brenda scene works partly because it’s presented in one long, unbroken close-up, whereas most of the film suffers from needlessly choppy editing. The lighting is problematic, too; it incorporates a lot of colorful highlights that don’t look bad, per se, but aren’t in keeping with the realistic tone of the material. And while I would’ve thought that I liked composer James Newton Howard, I wasn’t impressed with his work on 1985’s Night and the City and I wasn’t impressed with his work here. And yet despite all those flaws, I still feel some affection for this movie and the people who made it, simply because it’s such an un-cynical production. There’s nothing particularly commercial about Freedomland‘s content; I don’t imagine anyone would bother bringing it to the screen unless they genuinely cared about its story. This is also the kind of smaller, character-driven film that Richard Price specialized in during his ’80/’90s screenwriting heyday. You don’t see that sort of thing enough anymore, and I can’t help but see Freedomland‘s box office failure as one more small step towards the dominance of bloated franchises and needless remakes. • One fun aspect of this film is its abundance of familiar faces from Richard Price’s oeuvre. For example, Calvin Hart, the Jersey City detective who served as one of Price’s guides through the projects and was the model for the character of Lorenzo, shows up here in a small role as a Gannon cop. …In addition to another Wire alumnus, Price’s daughter, Genevieve Hudson-Price, who plays a younger member of Friends of Kent. And finally, Price himself chalks up one more Obligatory Richard Price Cameo. • An onscreen title graphic identifies the story as taking place in 1999, a year after the publication of the original novel and seven years before the release of this movie. I don’t know why, as the material doesn’t feel dated or dependent on period detail. • After Spike Lee’s relocation of Clockers to Brooklyn, NY, it’s cool to finally see Dempsy, NJ (also the setting of Price’s 2003 novel Samaritan) brought to life in a feature film. Next week: Richard Price’s most recent novel, 2008’s Lush Life, examines a fatal collision of the various worlds that inhabit Manhattan’s Lower East Side. This entry was posted in Films and tagged edie falco, film, freedomland, julianne moore, movies, richard price, samuel l. jackson, thriller. Bookmark the permalink.